I see no flaws with having a portable cooler that does double duty as a chair: you can take it with you everywhere you go. Filled with ice during the hot summer months there would be no better way to fly (or sit). I do however see one major flaw with the All-in-1 Chair. 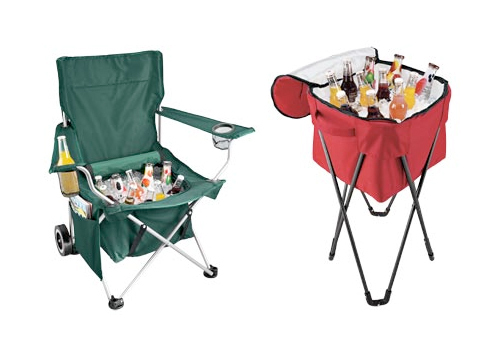 While there can be little doubt the combination of an ice chest with a lawn chair is an idea borne out of brilliance (the best inventors are the lazy ones), the design could use an improvement. A bucket of ice to sit on sounds like a great way to battle the heat, but when it’s time for another drink, standing up is required. Clearly, not a perfected design. However, add in the Foldable Cooler Tub, and you have yourself a sitting and drinking solution that’s almost perfect. I can think of one way to make this combination chair truly complete, but that would require melting the ice. Ahem.